September 27th 2002 12:39pm: Drummer Jan Egil”Octo” Øverkil asks the musicians at a discussion forum at VGNett what tribute bands they’d like to be part of. September 27th 2002 1:06pm: Ørjan”Visitor” Risa Svensen claims his dream is to form a Marillion tribute band, and perform Misplaced Childhood in its entirety. September 27th 2002 1:22pm: Geir “Ludo” Amundsen screams bloody murder to get the gig as bass player. 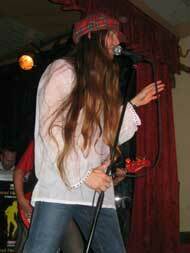 September 27th 2002 2:08pm, female singer Eva “Loyloy” Frostrud says yes to the gig. Guitarist Ørjan tried a couple of his key-fumbling friends, but to no use. That is… until Jan Magne “Jany” Bjelland came along. He lived in Ålgård, not far from Stavanger, so he was at least close to one of the other members. The quintet was complete. It took a while; Jany made his entry February 2nd 2003, four months after the first four members agreed to form the band. They even made concert posters for the band. Now it was up to the members to convince themselves that this would be a success. The band hooked up for a last rehearsal in Stavanger the night prior to the gig, just to get that Marillion feel to the weekend. The gig was a smash hit, and people came from all parts of south and west of Norway to witness this miracle of music. The band had a blast, and so did the audience, singing their a**es off to the opening song, “Sláinte Mhath”, as well as songs like “Sugar Mice”, “Hooks in You”, “Incommunicado” and the rest of a 1 ½ hour set. Misplaced Neighbourhood was a hit. Their next gig was a huge task; the Scandinavian Marillion fan club “The Web Scandinavia” wanted Misplaced to play for them at “Amatøren” in Oslo October 11th. The band could not refuse such an offer. It was an honour. This gig would be singer Eva’s departure gig. Work and travelling with this band simply could not be combined. After a great show before more than 100 die- hard Marillion fans, Eva left the band. Now what? A new singer could not be found that easily. Well, that proved to be wrong. 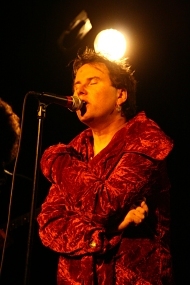 Drummer Octo’s friend Petter Selliseth had proven himself as a great singer in several bands in Trondheim. Would it hurt to give it a try? Hell no! A new gig was planned to be held in Oslo January 21st 2004. Petter had little time to learn the intricate vocals and lyrics of Fish and Hogarth. The band had new months of nerves to come, and only three days of rehearsals before the gig at “Gamla” in January. Petter proved to be a wise choice, and he gave Misplaced a new dimension. A charismatic front man and the singer that the band needed. Members of The Web Scandinavia said: “The band has a new edge with Petter. It looks like Misplaced Neighbourhood Mk II is becoming an exciting journey.” It was. And it is. - Petter has the rough edges that gives the band the power and soul that makes Misplaced Neighbourhood what it is; a great band. Not only a great tribute band, but a great band! - Ørjan is the man that gives both the band and the audience goose-bumps from his solos. They are sometimes so close to the original that it could just as well be Rothery himself playing the guitars. 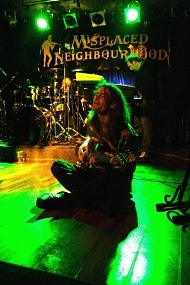 - Octo’s creativity gives Misplaced Neighbourhood dimensions Marillion never have had. - Ludo’s bass goes deep into the pocket of Pete Trewavas, and that looks to be in another world onstage. - And Jany finishes of the cake with pads and patterns that open the band perfectly. At “Privaten”, sweat was dripping from the ceiling. It was a magical evening, and Wilkinson and his family was pleased with both the exhibition and the band. It was a weekend to remember, and a new friendship with the artist that made Marillion’s album covers classics. The band has played a total of four gigs at “Gamla” in Oslo, and has done a near sell- out show in Trondheim, as well as a memorable gig at well known blues festival “Hell Blues Festival” in Hell, just outside of Trondheim. This festival audience was the first to see Mark Wilkinson’s logo for the band. Marillion fans will recognise this logo as it is made from the original Marillion logo. A new all time high came for Ørjan and Ludo in March 2005. At a Marillion Weekend in Minehead, England, they performed with Marillion in front of 2,500 ecstatic fans. The problem with projects such as this is that the members have other bands and projects. Petter, for instance, has a duo in Trondheim that has gigs quite often. Now, what could the band do when their frontman had another gig? Well, we already mentioned British singer, Rich Harding. Rich is the singer of a British Marillion tribute - Skyline Drifters. And just to make the band even more Misplaced, Rich lives two weeks in Holland, and one week in Bristol, and two weeks in Holland, and… “A lifestyle with no simplicity. And I’m not asking for your sympathy...” Well, you get the picture. Rich said "Yes" straight away, not knowing what he’s getting himself into. 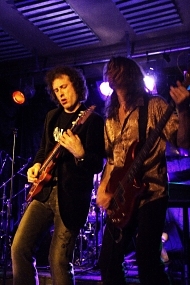 At the end of May 2005, Rich hooked up with the rest of the band for ONE rehearsal before the gig at Gamla in Oslo, and the second gig in Holmsbu. He even did a radio interview with rock- Radio “Radio Tango” in Oslo, supplied with Misplaced’s version of “He Knows You Know”. March 24th and 25th, Rich was yet again invited to Norway. And this time, he had to bring Skyline Drifters drummer Adrian Holmes. Petter and Octo were busy taking care of business, so with two members of the basic line-up out, Misplaced sounded somewhat different, but it still had the verve and soul that makes Misplaced Neighbourhood what it is - a great tribute to a fantastic band; Marillion. In July 2005, lead singer Petter decided to leave the band. One day later, Neighbourhood friend and guest Rich Harding thankfully said yes to the gig. The Neighbourhood suddenly got even more Misplaced. 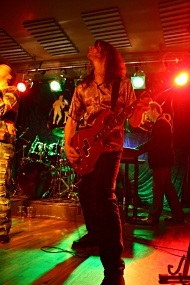 But the band are extremely thankful to have Rich in the band, and are looking forward to 2007 and new gigs. At this time, new gigs are being planned, but no-one knows when and where just yet. There might be an exciting event in 2007. Anniversaries are running close these days.